During a recent SOBDL event Shawna spun a wheel and won a free tour from the guys behind the Backyard Beer Tour. I decided to tag along and below are my thoughts on the new brewery tour in Toronto. 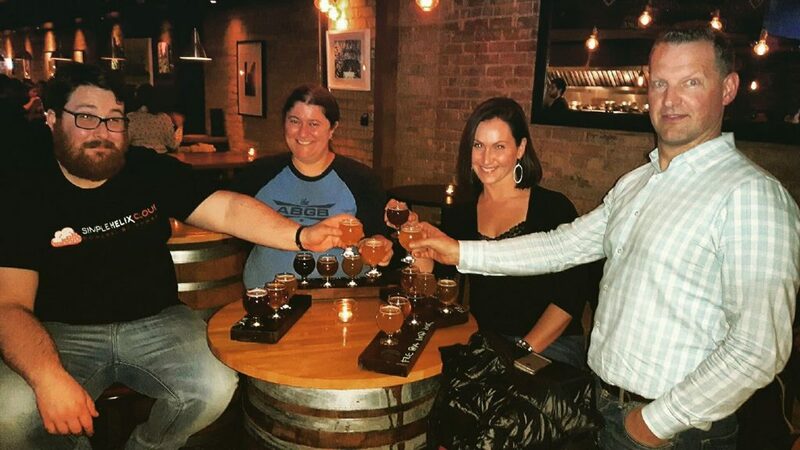 We have been on numerous beer and alcohol tours around the world including the two in Toronto we have written about: Beer Makes History Better and the Old Toronto Beer Lovers Tour. The majority of people taking a beer tour probably do not go on multiple tours. If you go to the brewery partners list on their website you can see the places you are likely to visit. We have been to every single one of them numerous times. Again, this would not be the case for the average person taking this tour. Our guide was brand new and we were her first group, this can be tough on anyone, not to mention we were total beer geeks! Keeping those in mind, lets begin. We will be talking about both the positives and the negatives of this tour. The meeting point for the tour was near High Park Subway Station. This was a bit strange as none of the breweries on the list are particularly close to this spot. For us it was quite a trip to get out there. If we had been told where our first brewery was going to be it would have been far easier for us to meet them there. There may be logic that isn’t coming to mind as to why they choose that spot. There was a subway issue and Shawna and I were late because of it. This of course was beyond the tour guides control, just mentioning it! From there we met our guide. She was friendly and helpful though a bit nervous, which is fair given we were her first group. She then guided us to a rented van that had the logo on it with magnets. The first brewery we visited was Rainhard. A favourite of ours. For tourists it should give people a view of a part of Toronto they may not expect. I’m not going to spend too much time going over each brewery since we have written about them all in the past. While there they ordered each of us a flight. It was mentioned that generally we would be given a flight of their standards but since me and Shawna were there they gave us some Hearts Collide barrel aged to end it with. Our guide knew the 4 people she was helping were all beer geeks to an extreme degree but showed us how she would go through the tasting tips if the group were different. She described how we should look at the beer, what to look for, to smell it and to see if we pick up what is expected given the style, etc. She seemed quite knowledgeable on the subject. She really only did this at Rainhard but I can’t blame her, it would get pretty repetitive doing it over and over again for an audience that has done this a million times before. We spent about 45 minutes at each brewery. With drive time the total tour took about 3 hours. The next brewery was Henderson Brewing Co. We were lucky and happened to be there during the launch of a new beer. I say lucky but it’s possible they planned the tour around it! We enjoyed our popcorn and beers, discussing home brewing at this point and learning a bit about the history of Henderson Brew Co, which, lets be honest, is still a bit short. From there we went on to Folly Brew Pub. A great place to end the tour as they have wonderful food available if you skipped dinner to go on the tour. Michelle from Folly took the time to go over each beer in our flight in detail, explaining how they are made and what makes them different from “standard” beers. Thinking back, of all the times we have been to Folly and talked with the brewers, this was actually the time we learned the most about their beers! In general we had a great time. We had some awesome beer, learned a few things and enjoyed the guide. Currently the price of the tour we took (3 brewery tour) is $84.99 before taxes and includes all of the beer + snacks, water and transportation. Prices are subject to change, please see their website for the most up to date pricing.